These light and fluffy gluten-free pancakes are easy to make. No buttermilk required! Oh my goodness. I love this recipe. I love this recipe so much. SO MUCH. SO. VERY.MUCH. Have I mentioned that I love this recipe? Each Sunday, Greg and I usually have pancakes or waffles for breakfast. That means that I’ve made this recipe while bleary-eyed more times than I can count. Sometimes I vary the recipe, I swap out the white rice flour for a whole grain flour. Or I add cinnamon. Or chocolate chips. Whatever I feel like making, basically. Before you tinker with the recipe, I suggest you make it as written. Why? Because this recipe makes the best, fluffiest, most wonderful pancakes you’ll ever eat. Pre-measure the flour. The night before you plan to make pancakes, measure the dry ingredients. Then, in the morning, all you have to do is add the eggs, milk, and oil. Use either my suggested flours or your favorite gluten-free blend. Just be sure it contains xanthan gum, this ingredient makes for the fluffiest pancakes. If your gluten-free flour blend doesn’t include xanthan gum add a 1/4 teaspoon. Use a nonstick griddle. 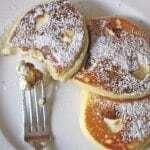 To prevent gluten-free pancakes from sticking to the pan, use a nonstick griddle or frying pan. 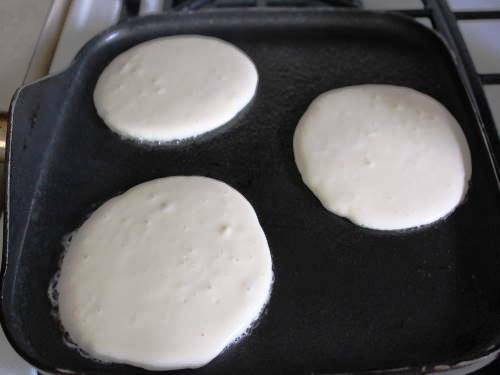 I prefer a flay griddle because the lack of sides makes it easy to flip the pancakes. Grease the pan. Lightly oil the pan, even if it’s nonstick, with either cooking spray or a little vegetable oil. This step ensures the pancakes won’t stick and makes them easy to flip. For a different flavor, add a pat of butter to the pan and allow it to brown slightly. The brown butter adds a subtle flavor and crunch to the pancakes. Serve right away or keep warm. Pancakes are best served hot from the pan. 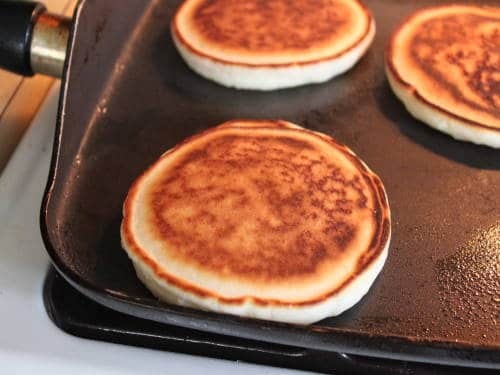 If you’d prefer to cook all the pancakes and then serve, heat your oven to 225 degrees F. Place the pancakes on a baking sheet until you’re ready to serve. Freeze ’em. 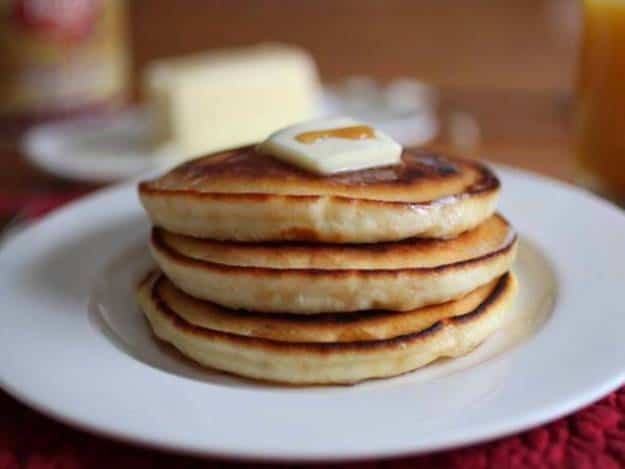 If you have leftover pancakes, or want to make a batch to freeze, cook the pancakes as directed. Allow them to cool completely on a wire rack. Place a piece of waxed paper between each pancake, stack and slide into a freezer bag. Gluten-free pancakes keep in the freezer for about two months. To thaw, microwave for a few seconds. Whisk ingredients together in a medium bowl. 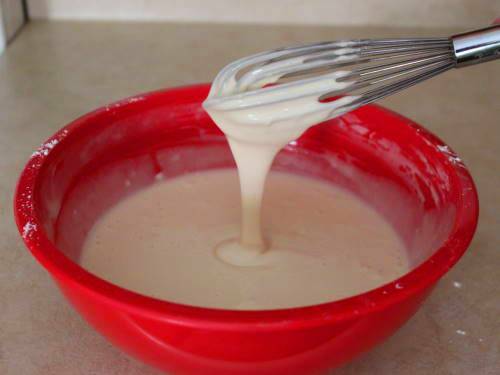 To prevent clumping, first whisk all the dry ingredients together and then add the eggs, milk, oil, and vanilla extract. You don’t need an electric mixer for this. A regular ballon whisk works great. Cook over medium-high heat. The batter should sizzle when it hits the griddle but you don’t want it too hot. When your pan is too hot, the pancakes can burn on the outside while they are still raw on the inside. Raw pancakes = blerg. To test your griddle, add a few drops of water. It should bounce across the pan and quickly evaporate. Use a Big Spatula. You don’t want to use a tiny spatula to flip a big pancake. Grab large spatula that’s firm enough to flip the pancake and flexible enough to get under it. Cook until golden brown. Some gluten-free pancakes cook up light and pale. Not these! If the pan is at the correct temperature, the pancakes should be golden brown all over. Cook the first side until bubbles appear on the surface. Then flip. The second side usually only requires a minute or two. Blueberry Pancakes: sprinkle a few fresh or frozen blueberries onto the batter immediately after you spoon it onto the griddle. Don’t mix the berries into the batter. They won’t distribute evenly and can turn the batter an unappealing blue-green color. 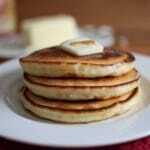 Whole Grain Pancakes: swap the white rice flour for millet or sorghum flour. Apple-Cinnamon Pancakes: stir one medium grated apple (granny smith works best) into the batter along with a 1/2 teaspoon of ground cinnamon. Chocolate Chip Pancakes: Replace the granulated sugar with light brown sugar and sprinkle a few chocolate chips onto the batter immediately after you spoon the batter onto the griddle. Serve with a dollop of whipped cream. Links listed below are affiliate links. 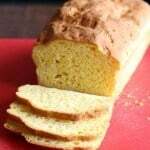 GlutenFreeBaking.com earns a commission if you use them to shop. These gluten-free pancakes bake up light and fluffy. And, the recipe is so easy, you can whip up a batch of pancakes before your morning coffee kicks in. Whisk white rice flour, cornstarch, sweet rice flour, granulated sugar, baking powder, salt, and xanthan gum together in a medium mixing bowl. Add the eggs, milk, vegetable oil, and vanilla extract. Whisk until smooth. Lightly oil a flat griddle pan. Heat griddle over medium-high heat. Pour batter, approximately 1/4 cup, onto griddle. Batter should sizzle when it hits the pan. Cook for approximately 3 minutes. Flip pancakes when bubbles appear all over the surface of the pancake and begin to pop. The pancake should begin to look almost dry. Flip and cook another 1-1 1/2 minutes. Serve with butter and syrup, if desired. *If desired, replace with 2 cups gluten-free flour blend. If the blend contains xanthan gum, omit the 1/4 teaspoon xanthan gum from the recipe. If the blend does not contain xanthan gum, be sure to include it for the fluffiest pancakes. I really love buckwheat pancakes. Could buckwheat be added to these or substituted? If so, how much and/or for which ingredient? Thanks. Yes, buckwheat would work. (Be sure to use buckwheat that’s labeled gluten-free.) I’d replace the white rice flour with buckwheat. If you’d like a milder flavor, use half white rice flour and half buckwheat. Hi there! Is corn starch the same as cornflour? I’m in Australia so I’m not sure if we just call it cornflour. Thanks so much! Yes! It’s the same ingredient! Could you substitute arrowroot or tapioca or something else for the cornstarch? We are also trying to avoid corn products. For this recipe, I’d use potato starch. Tapioca starch would work but I find it adds more structure. So I’m worried it would make tough pancakes. I am a diabetic like almost 50 % of the population (which means most likely 50% of the people like myself that have celiac or gluten intolerance have some form of diabetes) so rice, corn, potato and any most other starches/flours are not really permissable as they raise our blood sugar. This includes any ingredient labeled maltodextrin as it is made from wheat or corn. 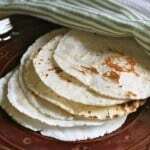 I have substituted tapioca flour in this recipe for the rice flour and it does not change the texture to me and it tastes good too. The Brazilians only use tapioca flour to make pancakes and waffles in their recipes. Most of their cooking seems to be gluten free – even the breads and diabetic friendly too. There are 2 types of tapioca flour – one is sweet and one is sour. I have found that I have the same problem with the sour as I do wheat and the sweet is hard to find so I am in the process of trying millet, sweet white sorghum, quinoa and white teff flours to see how they do with this recipe. Thank you so much for making it available to us. Glad you had success with the recipe using tapioca starch! Just to clarify, according to the American Diabetes Association, about 9.3% of the US population currently has diabetes and between 5% and 10% of the celiac population has diabetes. If you are looking for recipes free of most grains, check out my paleo recipes. They most use almond and coconut flour. Many of readers with diabetes really enjoy the recipes. As for the tapioca starch, sour tapioca starch is very hard to find in the United States. Most brands are the traditional “sweet” tapioca starch. So if you’re looking for it, Bob’s Red Mill sells tapioca starch. Unfortunately this does not track with the numbers between 2010 and 2012 which is more like 3.5 million in a 2 year period. Also not included in these numbers are the people that are Pre-diabetic (readings of 100 to 140) at 86 million who also should be watching their eating habits. This totals 29.1+86.0 (pre-diabetic) million or 115 million effected Americans in 2012 This makes the percentage 35% in 2012 Also not in their numbers are the people that do not take insulin and use diet and supplements to control the problem. My gastroenterologist tells me that 1 % of the population are celiac but the number goes up astronomically because of gluten interolerance. He also said that he is finding more and more of his patients having both the gluten interolerance and being diagnosed with diabetes every day. Since the numbers of diabetics grossly out number the gluten interolerant people it only makes sense that if when we are adjusting recipes for the gluten that we also take the diabetes into consideration for those that have not realized they have the problem yet. Thank you for the correction on the tapioca type most found in the US. I have to order the one I do not have a problem with (evidentially the sour) from a company that ships from Brazil and didn’t look at my orders before responding previously..
No problem! Glad you found the information on tapioca starch helpful. The rise of diabetes, all types, is alarming and should be taken seriously. I develop a wide range of recipes and not all my recipes will be the right fit for everyone. Can I use almond milk instead of normal milk? I’m trying to avoid dairy. These were so yummy. I did substitute tapioca flour for the sweet flour as I did not have any sweet rice flour at home. They were so fluffy and incredably good. It will be a go to for a very long time. Whole grain or all purpose gluten-free flour, yes. Tapioca flour, no. That will not work. These pancakes ARE the best! I’ve made the recipe before and loved it, but this time I had to sub a few ingredients for what I had, and they were still the BEST! THANK YOU, Elizabeth! I purchased your paleo baking cookbook and the ‘easiest cookies’ are the ‘easiest’ and delicious. Looking forward to trying more of your creations. So glad you enjoyed the pancakes! I accidentally put 1 cup flour and forgot to halve the other ingredients and it STILL worked – I made mini pikelets and they were fluffy and delicious. I don’t know how you do it but the two recipes I’ve used so far are fantastic, especially for a rubbish cook like me. Can I make ebelskivers (Danish Filled Pancakes) with this. I have the pan since going gluten free I haven’t been successful in finding a pancake recipe that I can use to make ebelskivers. I’d try it with one change. I’d separate the eggs and whip the whites. Then fold the whites into the batter. Let me know how it goes! I want to thank you for the fabulous recipe. Our grandson is particular about his pancakes and we have never found a recipe he has liked until this one! You made our day! Thank you! I’ve made these a couple times and the batter has been very thick both times. I end up with something that resembles biscuits more than pancakes and I have no idea what’s going wrong. I’ve never had any problems with your other recipes. That’s so odd! What flours are you using? I made these this morning and they were PERFECT! 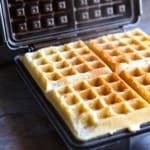 I did make a few small changes – I halved the sugar, used butter in the pancake mix instead of vegetable oil, dropped the xanthan gum, and swapped corn starch for arrowroot powder. I also altered everything with a weight (rice flours, starch, etc.) to match what my brands of flours/starch define as a cup, half cup, etc. I figured using the weights listed about would make the batter too runny. At half a cup of batter each, we ended up with six good-sized pancakes! The first two burned a little; once I got the temperature under control they cooked up just right 🙂 I have tried a lot of pancake recipes over the years, and this is hands down the best one. Even better than wheat ones! I hate to complain because it was probably my fault! I used Cup4Cup gluten free flour that already contains zanthum gum. I usually have pretty good results when I use it, but it could have been why my pancakes were so dense . When I put them in the frying pan, I couldn’t change the shape at all. Of course, when I use a gluten free flour, I still use the scale and couldn’t for this one. They tasted good, but they were thick. My husband commented that the pancakes were just a vehicle for maple syrup, lol. Next time, I guess, I will make them as you wrote the recipe. I was just too lazy this morning. And how are your pancakes so perfectly round? Do you use a ring to shape them? I couldn’t coax them into any recognizable shape! By the way, I do appreciate your doing this first so we don’t have to make 10 batches to get one good one! Yes, using a different flour blend, especially one that already contains xanthan gum would have greatly affected the recipe. I don’t use a ring of any kind when making the pancakes. The batter is a nice consistency. It spreads into a circle when it hits the griddle. From the sounds of it, your batter contained too much gum. That would make the batter very thick. You never gave the recipe only the method for the pancakes using gluten free flour & xantham gun. I’m new to gluten free baking. I bought a lot of brown rice flour. Can I use it in this recipe? Hi Elizabeth, can I check whether it is possible to use one type of rice flour (equivalent to 2 cups) rather than two separate types? Yes, it will work. The texture of the pancakes will be a little different but the recipe will work!